Two hours of practical professional advice from the man who has entertained the Royal Family on several occasions and who for many years was the choice of the world's richest man, Paul Getty, as entertainer. In each volume there is a classic feature trick explained in the fullest detail move by move. Years of performing experience have enabled Harold to perfect each effect to gain maximum effect. Packed with professional advice and including several live show extracts. 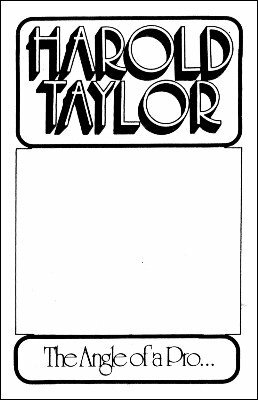 Volume 2 opens smartly with the Harold Taylor presentation of the marvelous Stodare Egg effect. Use this and you will be using a routine that has been used over and over again by one of the world's top pro's. Every wrinkle has been ironed out for smooth performance and maximum effect. Harold has been generous in releasing many of the real secrets of success in magic. Originally released by Martin Breese in February of 1979 as part of the Magicassette series.